Do you need pet and dog boarding services in the Cape Girardeau County area? At Sweet Pea Kennels we offer a safe and fun place to board your dog or cat overnight while you’re heading out of town, or when you just need a night out with no responsibilities! For all dog and cat boarding we charge $15-22 per night in our Standard Kennels and $21 to $30 per night in our Deluxe Kennels. And if you’re into saving money (really, who’s not? ), check out the boarding discounts on the pricing page! 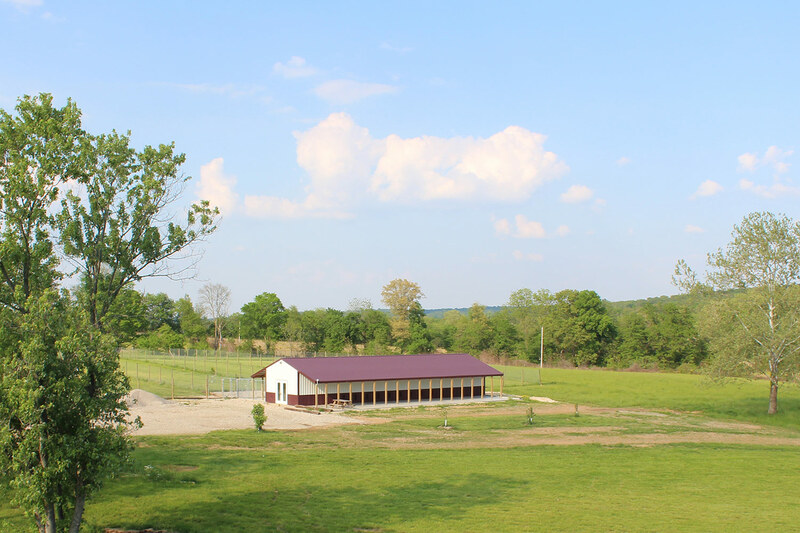 We reside just North of Jackson and Cape Girardeau Missouri on 20 acres of beautiful land surrounded by over 300 acres of woods and farmland, so we have PLENTY of room for dogs to run, play and receive a lot of attention when they are boarding at Sweet Pea Kennels! All dog boarding guests will have access to their inside kennel (4′ x 6′) and their outside kennel runs (4′ x 16′) all day, weather permitting. They will also be in our large play fields for a minimum of 2 hours per day where they can enjoy more than 12,000 square feet to run, play, and exercise. Dogs boarding in standard kennels will have a Coolaroo cot to sleep on. All dogs that board with us in a Standard Kennel receive an Express Bath (shampoo/rinse) before check out if they board 2 nights or more. Deluxe Kennels are available to our dog boarding guests that want a more personalized experience here at Sweet Pea Kennels. In addition to all the services provided in our Standard Kennels, our Deluxe Kennel dog boarding guests will receive additional play time in our large fields, amenities, and indoor privacy walls for quieter naps. Deluxe Kennel boarding guests are given a Fresh Butcher Bone (fresh-frozen or dried) upon check in, participate in an interactive doggie puzzle during their stay, receive 4+ hours of daily playtime in our fields, and a K9 Ballistics TUFF Bed (or similar) for added comfort. Deluxe Kennel boarding guests also receive a Full Bath (shampoo/rinse/nails/ears) prior to check out with 2 nights or more of boarding. Want even more out of your dog boarding experience? Our Deluxe Kennel boarding guests can add any of our grooming, activities, treats, services or other add-ons at a 10% discount. If you need cat boarding, we have a cat playroom which will allow your cat to ply, scratch, and climb to their heart’s content. Our playroom is furnished with catwalks, toys and cat furniture for their entertainment. We offer early and late pick-ups or drop offs that can accommodate early and late flights out of St. Louis. For those who don’t have time to drive out to our facility, we can provide transportation! Our Doggie Taxi can pick up your dog or cat at home, so we’ve got you covered! The Doggie Taxi serves our boarding clients in the Cape Girardeau and Jackson Missouri area. For those of you who are looking for more one-on-one attention for your dog or cat while boarding, or for a little play time in the swimming pool – check out our additional services on this page and contact us with any questions. Pool time or personal walks can make your dogs boarding experience more enjoyable. In order to keep our boarding kennel as clean and safe as possible for all of our dog and cat guests, we have boarding requirements for all pets staying at Sweet Pea Kennels. BOOK A BOARDING APPOINTMENT TODAY!